Sotomayor slipped into the event through the back entrance, and when Clinton saw, her she let out a big laugh. "I don't believe this," the former first lady said. "I am so glad to see you." Clinton aides did not know Sotomayor planned to attend the event and were just as shocked as the other attendees in line. Sotomayor told reporters that she was "just shopping" at Costco when she found out Clinton was signing books. Lewis slipped into the book event shortly after it began and surprised the former secretary of state. The two shared an out-of-earshot moment at Clinton's table, and then Lewis moved along like the other Clinton fans. "I wanted to come by and say hello to Mrs. Clinton; she is a very good friend," Lewis said. Asked by reporters if the former secretary of state should run for president in 2016, Lewis responded, "Yes, she should." In 2008, Lewis changed his endorsement from Clinton to Barack Obama because he said he wanted to reflect the will of his constituents. The event was more than just a book signing with notables, though. Clinton, who for months has acknowledged that she is considering running for president, came face to face on Saturday with some of her most ardent supporters, many of who donned "Ready for Hillary" stickers and other paraphernalia urging the former secretary of state to run for president. "Hi, Hillary, I worked on your campaign in 2007," said one woman with a smile. "Excellent," Clinton said, before the woman added that she was "so excited about whatever is going to happen in the future." "2016, we are ready for you," said another woman as she walked away from Clinton. Using an old ticker, Clinton advance staff tallied how many books Clinton had signed. After three hours, Clinton had signed upwards of 1,000. To get a signed book, attendees had to be Costco members. According to a Costco employee, the box store sold 164 new memberships on Saturday, a number that far eclipses the 20 to 30 the location sells on a normal Saturday. Some attendees used their moment in front of the former first lady to put in a good word with the Democratic frontrunner for the 2016 nomination. John Wertman gave her a coin and urged more geography education, while others mentioned they had worked for her at the State Department. Bryan Mendiola, a Georgetown student, handed Clinton his girlfriend's resume. Clinton smiled at Wertman and shook his hand. Mendiola told reporters after the exchange that he gave it to her for a possible "job or a campaign." 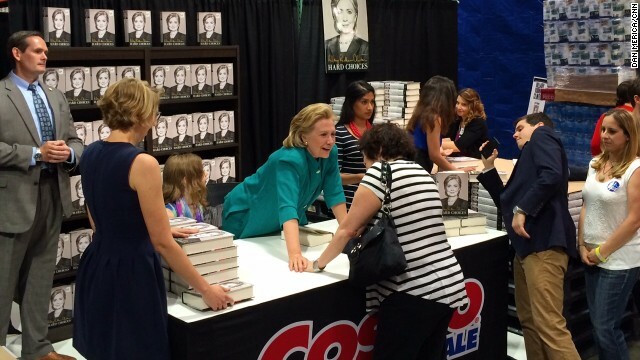 The Costco event capped off the first week of Clinton's memoir tour. "Hard Choices," a more than 600-page tome on Clinton's time as America's top diplomat is widely seen as a precursor to a possible presidential campaign in 2016. In the coming days, Clinton will hold events and book signings in Canada, Seattle, Los Angeles, Kansas City and Texas. When will she be on Fresh Air ? She will be the next president , 2016. Somebody's has to give her a hard time , her husband can't . sure makes one wonder just how independent and objective sotomayor is. always votes like a leftist and hugs other leftists. and the clowns in here complain about the conservative justices. the leftist judges are 10 times worse with not one cell in their body that is objective. A chance meeting of two Great Ladies, a Supreme Court Justice and a future US President! Well lets hope she decides to run for POTUS...if she runs she will win and this country needs her!